Yo-Yo Ma tilts windmills with the Boston Symphony Orchestra. the Boston Symphony Orchestra. Photo by Stu Rosner for the Boston Symphony Orchestra. 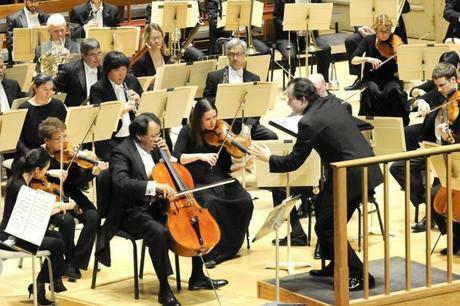 The Boston Symphony Orchestra played its third and final Carnegie Hall concert on Friday night. This venerable orchestra has found its passion and spark again under the baton of music director Andris Nelsons. As an ensemble, it is moving forward in a bold and forthright manner. And yet, some of its past tendencies appeared in this concert, resulting in a curios evening of variable quality. The concert opened with Mozart. Symphony No. 23 is one of his lesser works, a trifle from his employment at the court of the Archbishop of Salzburg. It is a single movement, more like an overture than a symphony, with no pauses between three sections in different tempi. However, the BSO players did their duty. This is after all Mozart, delicately crafted with string writing with the strength and delicacy of fine porcelain. Mr. Nelsons' current obligations (in addition to his Boston duties) include a contract in Leipzig as the music director of the Gewandhaus Orchester, the legendary orchestra founded in 1781 and made famousby Mendelssohn in the 19th century. Partita, by the German composer-clarinest Jörg Widmann is a co-commission between the European orchestra and the BSO. This evening marked the first New York performance of this five-movement, forty-minute work for very, very large orchestra. If the Mozart symphony was finely made china, this was more like patchwork, as if the composer had built a set of random structures out of multi-colored musical Lego® blocks, blocks that belonged to other, greater creators that came before. There were snatches of Shostakovich, leitmotifs from Wagner operas, and tiny chunks of Strauss tone poems, chopped up and reassembled into movements that vagueley resembled the sections of a Baroque suite. The first movement was slow-fast, the second slow, the third a set of orchestral explosions labeled "Divertimento." It hardly lived up to its label. Mr. Widmann's work (the program boasted that its tonality of B minor was "inspired by Bach" and that it "borrows substantially" from a forgotten Mendelssohn clarinet sonata) is less composition than construction. The end results proved less than compelling. (Leaving the hall, a colleague of mine speculated onhow many fine and talented composers could have used this opportunity to create something worthy and interesting.) The BSO and Mr. Nelsons, with a huge percussion and wind presence including contrabass clarinet, played the piece well, but the whole long exercise seemed curiously pointless. The aimless of existence and the attempt to find meaning in the world lies at the heart of Cervantes' Don Quixote, the inspiration for an 1897 tone poem from the pen of Richard Strauss. It is a set of free variations on a theme that depicts the knight of the woeful countenance, with the part of Quixote taken by a solo cellist. Here, Yo-Yo Ma was the guest of honor, strapping on the rusty armor, taking his lance (well his bow) in hand and preparing to do battle with the BSO. This proved a thrilling ride. Andris Nelsons proved that he had meticulous and rigorous command of this sometimes sprawling work, providing a rich, woven backdrop for the cellist's adventures. The whoosh of the windmill blades, the roaring wind as Quixote and Sancho Panza (played, alternatingly by viola and euphonium) rode a sawhorse, convinced they were flying through the air) and the bleating of sheep in the woodwinds all came through with convincing clarity. However, what really made this performance work was the authoritative presence of Mr. Ma, whose cello artistry brings conviction, truth and heart to Quixote's adventures and Strauss' long, challenging melodic lines.